Drain liquid from the tofu and press to remove all excess water. Wrap with a clean towel or paper towels and place a skillet or heavy plate on top. 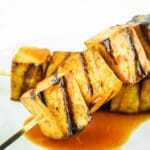 Cut tofu into large cubes** and place into a gallon ziplock bag or large bowl to marinate. In a mason jar or small bowl, mix together maple syrup, tamari, olive oil, and sriracha until well-combined. Save 2 Tablespoons of the marinade for later, then pour the rest over the tofu. Toss to coat. Seal the bag or bowl up tightly and refrigerate for at least 30 minutes. Add tofu cubes to skewers and set aside. Preheat grill to medium high, spritz the grate with oil, and place tofu skewers on the heat. Grill 15-20 minutes, rotating every 4-5 minutes. Remove from heat and drizzle remaining marinade over the tofu. Serve and enjoy! ** We sliced our cubes quite big, but you could go slightly smaller for quicker cooking time. You’ll just have to be more gentle when tossing in the marinade and grilling.